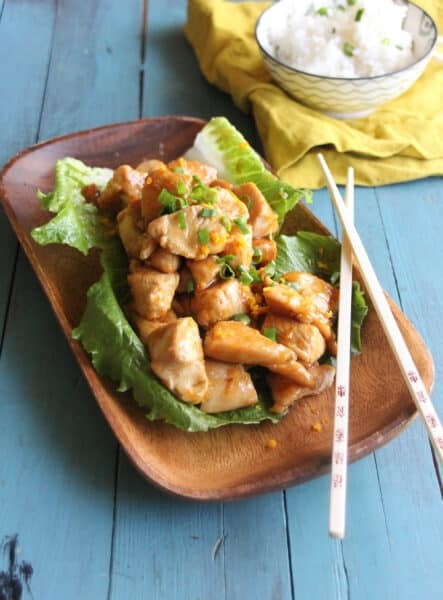 Faster and healthier than takeout–this delicious, homemade orange chicken recipe is ready in minutes, and is better than Panda Express! You know how sometimes a brand name becomes synonymous with the product it makes? Think Kleenex or Xerox. We love Panda Express, and it automatically means “Orange Chicken” when we hear it. The conversation has become shorthand: “Wanna Panda?” is all that needs to be said. Recently, I wanted some Orange Chicken but didn’t want to: load the kids in the car in the rain, drive to Panda Express, unload the kids, wait in line (juggling a wiggly toddler saying, “Down!” the whole time), load the kids back in the car, load the food in the car, return home. Besides, why pay for something you can make? Let’s do this. Cut the chicken into bite-sized pieces. I prefer to do this while the chicken is partially thawed, since that makes it easier to cut. 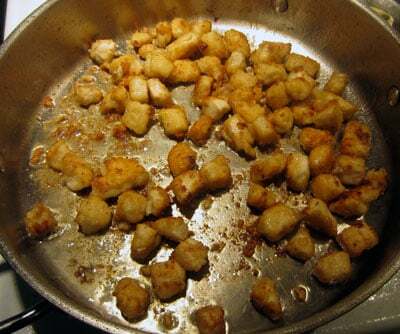 Heat the butter/oil in a large pan until shimmering. Add half of the chicken (it’s OK if they’re still partly frozen when you put them in) and cook until nicely browned. Don’t put all the chicken in at once because the pan will get crowded, it won’t stay hot enough, and you won’t end up with the tasty browned bits of chicken deliciousness. Take the first half out and set it on a towel while you cook up the second half. I put the chicken on a towel instead of a plate because the towel will absorb any condensation, preventing sogginess. While the chicken is cooking, prep the sauce. Mix the orange juice, orange zest, oyster sauce, honey, ginger, and red pepper flakes, if using, in a measuring cup. The honey will probably stay in a big lump in the measuring cup, but it’ll melt in the pan. 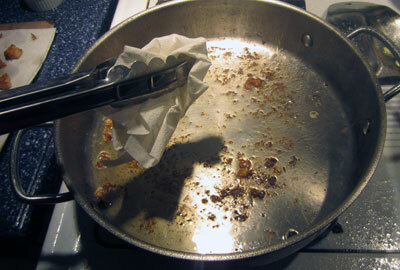 Take out the second batch of chicken and blot the excess oil out of the pan with a paper towel. Leave the crunchy browned bits in. 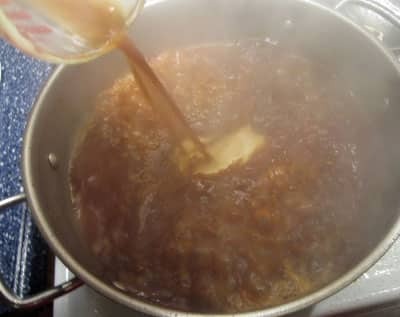 Pour the sauce into the pan, making sure the honey comes along for the ride, and scrape up all those yummy browned bits. You’ll know the sauce is the right thickness when your spatula leaves a little blank trail behind it. Toss in your chicken and heat it through. Serve with steamed rice or loaded fried rice. I like to make a big batch of Orange Chicken sauce and freeze it in these canning jars. Then I can pour the sauce over store-bought chicken strips, make some rice, and dinner is done! BOOM. Love this recipe? 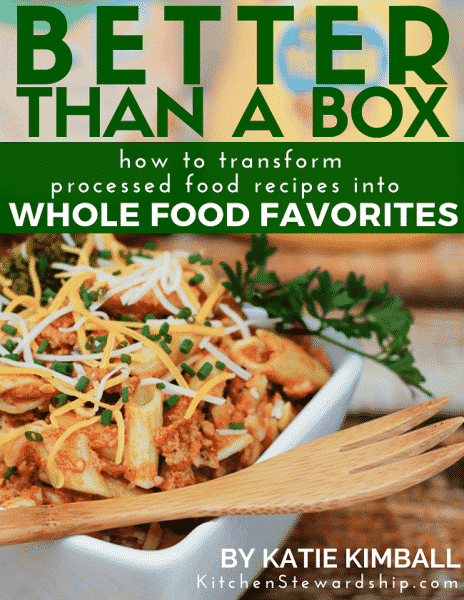 Then you’ll love the healthy copycat recipes in Better Than A Box. This fantastic ebook contains more than 50 recipes for your favorite packaged foods, made healthy and from-scratch. Plus it teaches you how to remake boxed foods so they’re healthy and natural! Our family’s favorite recipes from Better Than A Box are Homemade French Onion Dip and Dad’s Cheeseburger Helper. YUM. Cube the chicken into bite-sized pieces. I prefer to do this while the chicken is partially thawed, since that makes it easier to cut. 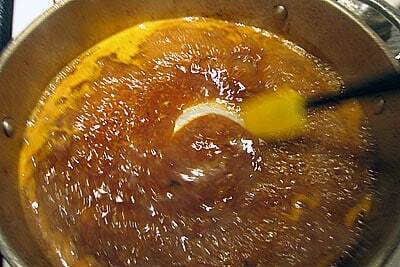 Heat the butter/oil in a large pan until shimmering. Add half of the chicken (it's OK if they're still partly frozen when you put them in) and cook until nicely browned. Don't put all the chicken in at once because the pan will get crowded, it won't stay hot enough, and you won't end up with the tasty browned bits of chicken deliciousness. While the chicken is cooking, prep the sauce. Mix the orange juice, orange zest, oyster sauce, honey, ginger, and red pepper flakes, if using, in a measuring cup. The honey will probably stay in a big lump in the measuring cup, but it'll melt in the pan. You'll know the sauce is the right thickness when your spatula leaves a little blank trail behind it. Toss in your chicken and heat it through. Serve with rice or noodles. Sounds yummy! Thanks for sharing on Wildcrafting Wednesday! I am making this for Venus tonight! As for certain words and meanings, when my older sister said “Do You Want to go to Africa,” it meant a trip to 7-11 and a delicious, old fashioned, cola slurpee. This was back in the day when there was only one drink called a slurpee, and the slurpee machine at your local 7-11 had but two choices: Cherry or Coke. Looks delicious, and I’m betting it’s a LOT healthier for you than Panda’s version! I am pinning this recipe and your loaded fried rice one. Thanks for sharing! Mmmmmm. That looks soo good and sounds so easy to make too! Found you through the NY Melrose Family’s Whimsy Wednesday Link Party. Num! Sounds delicious and easy. 🙂 I’m pinning your recipe so I can try it soon! Just love your Orange Chicken, we will really enjoy it! Hope you have a fantastic week and thank you so much for sharing with Full Plate Thursday. I have fish sauce on hand – can I substitute that for the oyster sauce??? Fish sauce is more liquid than oyster sauce. Oyster sauce is really thick like a BBQ sauce or honey. I can NOT wait to give this a try! Looks amazing! This looks great! I would love to have you link up at href=”http://redcrowgreencrow.wordpress.com/2013/03/22/inspired-weekends-11/”>Inspired Weekends! Must try!! Thanks for sharing! Visiting from Deborah Jean’s Dandelion House for Farmgirl Friday. Just so you know – I pinned this twice! I have to try this. I tried another orange chicken recipe which turned out to be a lot of work. This looks so much easier. Thanks for sharing your yummy recipe at Fabulously Frugal Thursday! Making it tonight. Going to spice it up a bit and while the chicken is cooking going to pour Sriracha over it. Do you know if I can substitute fish sauce for the oyster sauce? You could probably sub hoisin sauce, but fish sauce is a very different flavor. If you try it, let us know how it tastes! It smells and tastes very similar to hoisin sauce. Not fishy at all! I would NOT substitute fish sauce. It has an extremely strong flavor that is completely different from Oyster Sauce. A very small amount goes a long way and 3TBS of it in this dish would ruin it. Hoisin will work! Mmm, orange chicken is one of my favorites! I am going to pin this and make it soon!! Yum! I am making this for dinner tonight. Thank you so much for sharing. Found you from New Nostalgia, nice to meet you. Oh wow, that looks so delicious! We love Panda Express too, so I’m especially happy to find this recipe. I pinned it and can’t wait to try it! I’d like to invite you to share this post and up to two others at our From the Farm Blog Hop, which is live right now. Your style of blog posts would fit right in with the wonderful posts that are shared! Awesome, thank you for sharing. 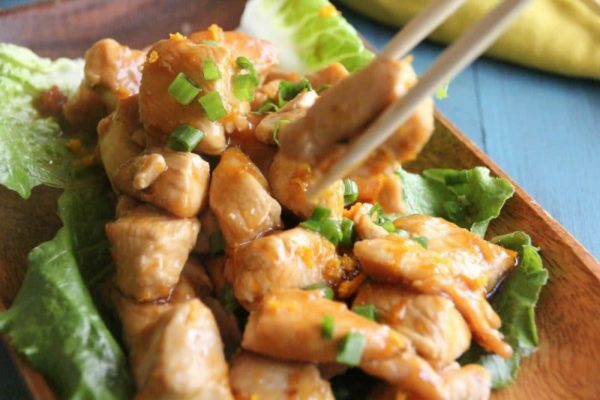 We love orange chicken, this one looks easy and much healthier! I will try this one! I have all the ingredients on hand too. Visiting through link-up! I love the orange chicken at the Panda! Thanks so much for posting this recipe and the pictures! I am going to make it! Gotta try your version! I love orange chicken! Looks great! I pinned it! oooh looks delish – thanks for sharing! My husband would love this! Thanks for sharing. I can’t wait to try this! Thanks so much for sharing at All My Bloggy Friends! MUST TRY! Panda orange chicken is the best! I love Panda Express so I can’t wait to try this out! 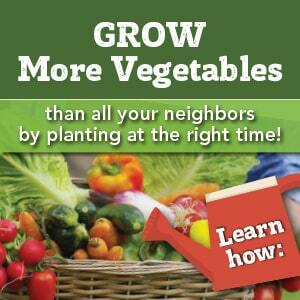 Thanks so much for sharing this at Wonderful Food Wednesday! Pinned & sharing on FB!! This sounds AWESOME!!! Pinning, I can’t wait to try it! P.S. Love your blog! This looks really good! I love recipes from restaurants that I can make at home! I would love to have you stop by and link it up to our party! Sounds delicious! Will have to try it very soon! I am so using this recipe. I tried the Panda Express orange chicken a few weeks ago and it was magical. Okay, I’m back; I made this for dinner tonight, and it was OUTSTANDING. Thank you!! I must have done something wrong because my orange chicken was not very good. I tasted too “orangey.” I followed the steps exactly so I’m not sure where my mistake was. I made this the other day and mine wasn’t too orangey, but mine was super, super liquidy and never thickened like real Panda Express Orange Chicken. I think if I ever wanted to make orange chicken again I would find a different recipe. Sounds great! I’m pinning! Thanks for linking up on Made in a Day! I’m definitely trying this recipe. Pinning! Great share. Not only did you save the trip but you probably made it a lot healthier too. I am pinning this one for dinner one night. I am not sure about Oyster Sauce. Is it in with the other Asian ingredients usually? Thanks for sharing at What’d You Do This Weekend. Thanks for stopping by! Yes, you can get it in the Asian section or at Amazon: http://amzn.to/12SQ6yf. It’s great in stirf-frys too! Yes! I’ve been waiting for this recipe! THANK YOU! & thanks for linking with us this weekend at One Sharendipity Place. Have a great weekend ! I am so going to have to make this for my husband. He will ONLY eat Orange Chicken at Panda, but it always makes me worry about the contents of it, health-wise. Thanks for the recipe! Mmm… This looks and sounds soo good, that I’m sure we’ll be trying it before the week is out!! Thank you so much for linking up with us at One Sharendipity Place!! Ohhhh this looks so yummy!!! Thanks so much for sharing this at our “Best Of The Weekend party”! I have pinned this to our party board and another big board too. We hope to see you again when the party kicks off Friday eve at 8PM EST. This looks delicious! I can’t wait to try it! Thanks for sharing your recipe at The Pin Junkie Link Party. It was featured this week! I hope you’ll stop by to get your featured button. Thanks again for the inspiration and have a wonderful weekend! Just pinned and shared on Facebook as one of this weeks Freedom Fridays Features!!! Thanks so much for sharing at Freedom Fridays!!! Found you through SITS. I was sure that Orange Chicken was made with a ton of sugar. Good to know that the ingredients are what you have here. Not only will I cook it at home (because my family loves it) but, I will let them have it at Panda. Thanks for the recipe. I am sure that the Panda version is full of sugar and all manner of low-quality ingredients – but this homemade version is definitely healthier. Doubled the sauce and it was perfect. Do you use fresh OJ or can it be something like “Simply Orange” juice? You can absolutely use store-bought orange juice! I live in Eastern Europe…and my little store doesn’t carry oyster or hoisin or fish sauce. (If it does, it is written in Russian or Georgian, and I cannot read either! 🙂 Can substitute something for those sauces? Thank you! Tried your recipe tonight and it is the best really! Thank you! Drudging the chicken in corn starch before frying is a great trick as well. Good idea, Cindy! I know there’s some software that can do this…will research it and add that option. Thank you for this recipe! I made it this evening, and my family loved it… couldn’t believe I did it myself! 🙂 Hubby asked me to make it again soon…. so good. Thank you!! Is there anything I can use instead of oyster sauce? We eat kosher and gluten free in our home. Can you leave the oyster sauce out, can you replace it with something else? The ingredients in that include MSG, sugar, modified corn starch and wheat flour.. unless I’m looking at the wrong brands. I’m kind of late to the party here, but I made this with my 7 year old tonight and she said it’s AWESOME. 😉 Thanks for a great recipe! Pam, this sauce is so good! I used it on some greens sauteed with onions and garlic today (with a little Sriracha, of course), and it was perfect. I have GOT to try this; sounds yummy! This looks so good but has anyone tried this with lemon juice for lemon chicken? I don’t always have orange juice in the house but lemon juice is usually available because I use it in my baking and jam-making. Just made this for dinner tonight. My husband says it taste good but my sauce didn’t get think. Any thoughts? I made this tonight! It had a VERY strong orange flavor. Other wise it was delicious and very easy to make. A bit of cornstarch dissolved in water or juice should thicken it right up. Glad you liked it! I just tried this recipe and it was wonderful. I used imported soy sauce instead of oyster sauce, added much more zest, and some chopped shitaki mushrooms to the mix. Over steamed rice with a side of dumpling boiled in shitaki broth. It was a big hit in my household! My kids love orange chicken from panda express. I am definitely trying this one this week. You can also try coating the chicken first with flour and cornstarch before frying them. Made this tonight. Used lemon and lemon zest with 1/2 OJ. Toss the chicken with cornstarch first. Extra ginger and thicken with cornstarch and juiced. Added bok choy and peapods. Delicious!!!!! Great recipe! Tried it last night and my family loved it! I also sautéed some veggies with some of the extra orange sauce that I made. Very good! Made this tonight and it came out great.. My g/f is vegan, so I actually made two batches in two pans, one with real chicken, one with a “chick’n” substitute. Both came out great. If you whisk all the sauce ingredients together in the measuring cup, you’ll have no problem with the honey sticking anywhere. Also, by happy coincidence, the honey in my cabinet is Tangelo Orange flavored, which I think probably added to the wonderful taste. 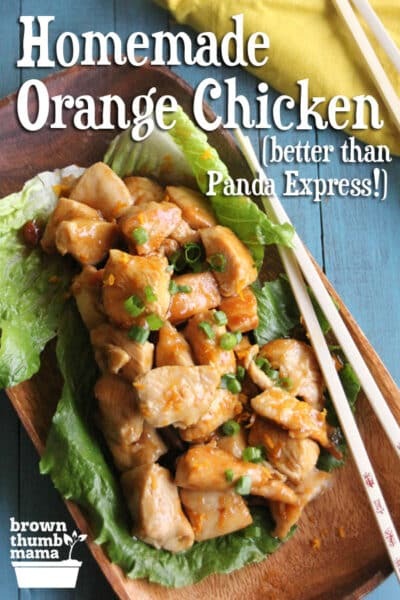 I will have to try this… Panda Express’ orange chicken is hard to beat! I’m going to see if this is true or not 😛 Thanks for the recipe! I may just have to make this recipe twice to see which works best! Excellent! Let me know which one you recommend! I made this tonight and it was amazing, especially considering how easy it was. I added siracha as well as onion, carrot, and red pepper. Everyone loved it! Way better then takeout! I agree with Cindy. Would love to see a printable recipe option. There are plenty of great WordPress plug-ins that allow you to print. I use Recipe Card but Zip List is also very popular. 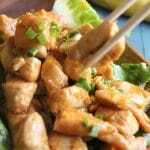 I have tried several panda copycat orange chicken, this is the closest I have found, and we have it about twice a month. Thanks so much!